New life for your platform rocker! These durable standard size springs ensure years of rocking pleasure. Great springs. Replaced a cracked spring on a platform rocker that is more than 60 years old. Now the rocker doesn't sit so far back on the platform and is very comfortable. Excellent product for the price and perfect fit. Spring set was PERFECT! Fit right to our old clawfoot rocker. Installation was simple with not modifications necessary. The rocker sits up like it's supposed to. THANK YOU! Found your website, 7 days later my rocker was ready to rock again. Was just what I needed to fix our rocker. And I had ordered more than I needed, and my refund was handled promptly. These were perfect fit for my husbands favorite log rocking chair! These were a perfect replacement for a chair handed down in the family. Holes lined up perfectly so no adjustments were necessary. Thank you for the promptness of delivery on the rocker springs. This chair belonged to my Grandfather and my mother was rocked in it as a baby. She will be 85 in June, so as you can see, this chair has great sentimental value for me. I have to replace the springs about every 6 years. Thank you for being available. These are and exact replacement for a broken spring on my Lazy Boy Rocker. Springs are definitely sturdy and were simple enough to install. Purchase and delivery without a hitch, would definitely buy from Rockler again and recommend! These springs made a 1960a era swivel platform rocker sit like new. It was an exact replacement for the broken spring in a favorite chair. The springs matched perfectly to my old springs. Very satisfied with them. Love my new set of springs for my 2001 Lazy Boy rocker recliner! my grandson can now rock in his favorite chair again. Perfect Fit for my Rocker! The springs were the right size and just about an exact replica of the original springs from at least 40 years ago. They were easy to put on - even matching the same holes. Woohoo! Great Rockler Springs! Now my old platform rocker doesn’t lean back so far. I would buy these again in a heartbeat! Antique Rocker rocks on with new Rockler Springs! Was restoring a 125 year old platform rocker and the original single coil springs were shot. These replacements worked out very well and the rocker now works great. 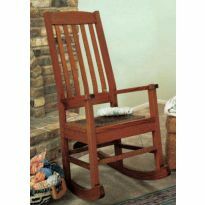 Perfect replacement for broken springs on existing rocking chair. Mounting holes lined up perfectly with broken spring assembly on old rocking chair. They were perfect for my refurbished chair!!! These spring work great. The best part is there is no squeaks at as I rock. We used these to replace the springs on a mid century modern chair built in 1955 - they are perfect and the chair rocks just enough now!! So glad we found Rockler. Those rocking chair springs worked great on my wife's lazy boy. Now I can sleep. The springs fit perfectly and our rocker is as good as new. Good quality product with exemplary delivery time. We have been looking for these springs for quite a while. We found them by doing a basic internet search. These were very reasonably priced. The checkout process was seamless and quick. We received the items within days - not the weeks I was expecting. The products are of excellent quality. Thank you and we will purchase from you again should the need arise. 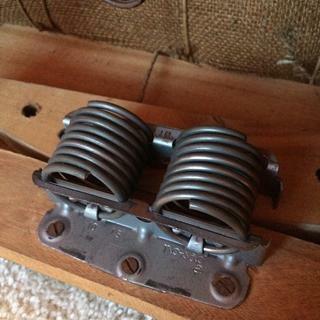 these were identical to the springs that were on the chair when it was built in the 1950's. Had no trouble installing them, followed advise about using screwdriver to open spring when aligning holes. Great product, will use again if needed in the next 60+ years. Very good product description with all the necessary technical measurement s to make a purchase decision. Product worked great as described. I purchased an antique Eastlake rocker and the springs were rusted together! These are the perfect replacement! Fabulous find, great price and fast shipping! Right size and tension,screw holes even lined up. These were bought for a chair that is about 90+ years old. Worked perfectly and exact fit. Thanks for springs. They worked flawlessly. The transaction was quick and easy. Thank you. I have a platform rocker whose springs were perhaps 50 years old and the rocker was scrapping wood on wood. I replaced the old with the new but honestly no fault of the springs but the rocker still rubs wood on wood so I have to do some sanding. The springs themselves are doing what they are supposed to do so can't find fault with them, they are great. Work perfect. Exactly what I needed. Great price! They bolt right up on the 25+ year old rocker. So far so good. No drilling needed on this old rocker just reused to old screws. It was easy to order the springs from this site. They came in a timely fashion and fit perfectly. Now the rocking chair is set for the next generation to enjoy. It was a pleasure doing business with the guys at the store and the springs work perfectly! They're an exact match! twice before. The current set seem to be working very well. Perfect fit for my great-grandfather's platform rocker. I thought I'd have trouble replacing the old tired worn out springs on my great-grandfather's leather wingback platform rocking chair. I ordered the first ones I saw even though I had my doubts regarding its appearance on line. I then checked on Rockler's website and immediately canceled the first set and ordered Rockler's with confidence. I purchased these spring to repair an old rocking chair. Original lazy boy spring assembly broke after 13 years. 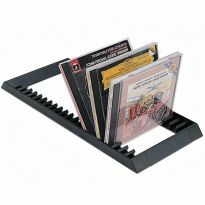 They're well made and great for platform rockers. The dimensions of the springs and mounting brackets on your PDF file match my broken spring. The illustrations of springs were very helpful also to make sure i am ordering the correct part the first time.Thanks , look forward to receiving the part very soon !! I am building a child upholstered rocker. My father got the pattern when he built furniture. Replacement part on vintage rocking chair. My rocker springs broke after 25 years. To replace the springs in my Lazy Boy rocker. I'm a heavy rocker so the springs don't usually last long, but these do. Thanks! It was exactly what was on the rocker I am restoring. My rocker springs are broken/worn out ant I needed a new set of springs. 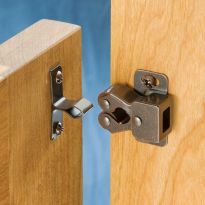 for years i have used Rockler products for my furniture repair Co.
there is always a great selection and competetive pricing. thanks for being there for those that need. Looks like what I need to fix my chair. Been looking for springs to replace the springs that broke in my Lazyboy rocker recliner. 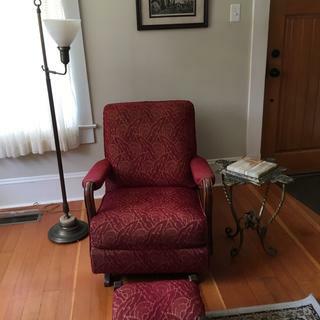 My upholstered platform rocker leans back too far. Someone recommended these to fix this issue. Because they matched old ones. 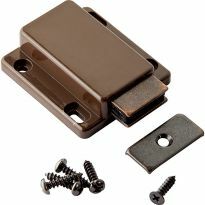 One of the spring brackets is broken in my recliner so I will repair it with these new parts. Chose as a replacement part for a failed spring. because it was the only spring I could find for my chair and it came as a pair. now I have a back up and it matches what is on my chair.and now I don't have to throw my chair away. spring on rocker broke after 15 years. $1.00 a year,fair enough. BEST ANSWER: Yes, wondering how you solved it!? Have just fitted springs to new chair, feels like you are going to fall over backwards , is there some special way to fit them?? BEST ANSWER: I had the same problem until I moved the spring set forward 2 inches on the pedestal. You will have to try trial and error to fit it correctly. That problem is usually reserved by a stop installed on the chair body or its rocker assembly. You might move them forward. It may help. I have two rocker recliner chairs that are so stiff and dont rock easily. Is there a way to fix this? How do you spread the springs to reattach to the original chair? BEST ANSWER: The new springs were almost an exact match to the original springs bracket and all so to begin with the hole pattern for the screws has to match - if the hole pattern doesn't match the spring set is not really the right one. 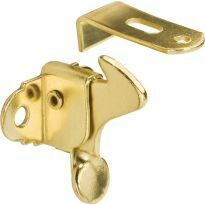 Once you are sure the hole pattern is the same and the old bracket and spring is off, screw in the screws in the chair's bracket and next you need to put in one screw in the base. The screw hole should not be very far off but you may need to use several flat blade screw drivers to pry the spring coils apart. Plan on doing this with two people working on it. So once you have the two screws in the chair side bracket and one screw in the base bracket you can use the base to line up the last screw hole. Just plan on taking some time and be patient - some times it took several attempts to do each step. There again, if the hole patterns aren't identical, you have the wrong spring set. Good luck. Attach spring to chair bottom. Use flat screwdriver inserted between spring, turn to spread and attach to rocker side. You should not need to spread them. The two pieces of wood that the spring attaches to should be touching. Shouldn't have to when in normal position. Springs should spread only when rocking. I just bought a 70 y o modern Heywood Wakefield platform rocker; which the 2 curves rock on each other, not on a inner lower shelf like I saw on another platform rocker. I do not like the action of it; too stiff, too short a span, too the return too quick. I am concerned that the short span has to do with the shape of the rocking pieces; these are angled, not a balanced half moon. perhaps that is to slow the backward motion, as there are no stops. As far as the too quick, jerky & stiff action, I want a more leisurely rock, paced to a heartbeat, not a jackrabbit. I presume the coils ate too stiff & perhaps need a less heavy duty pair? but ads claim "never sag" but my issue is I wish they would relax more. so I am not sure replacing them will solve the problem. I wish I could stretch out the ones that are on there. mine have 9 coils & I see that advertised as "heavy duty". will just swapping them out for a 10 coil "standard" pair slow it down? want some physics understanding here before I change the original & invest in non returnable parts. Thanks for any insights..
BEST ANSWER: Sorry without seeing the frame that these are going on I cannot help. 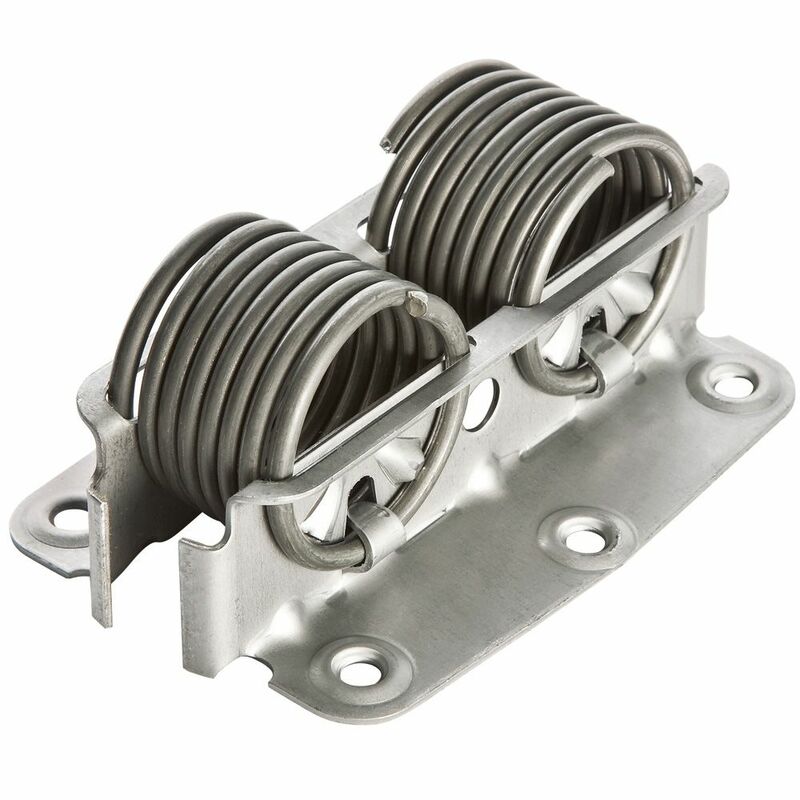 The biggest thing would be if these springs are compatible with your chair, I cannot tell without seeing the rocker base frame these will attach to. I installed them on a pair of old lazyboy rockers and the were excellent and seemed to be like the originals. Good Luck with your search. What is considered a pair? Is a pair for both sides of a rocker? BEST ANSWER: Yes. 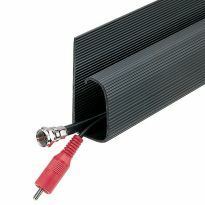 They come in a sealed plastic bag that contains two of the pictured components, one for each side. Each component has two springs (one controlling the rocker motion one way, the other controlling it the other way), but that's not the "pair." You'll get two components, enough for both sides of one chair. I bought a pair and got a set for each side of the rocker. I understand your question as there are a pair of springs on unit. One for rocking forward and one back. Easy replacement screws fit the same holes. Yes; a "pair" implies a matching set, which means 2. One for each side. How do you spread the springs so that they can be reattached to the original base and seat? BEST ANSWER: First I attach three screws to the top or bottom bracket. Then with the help of another person to hold the chair. I take a long screw driver and slide it between end of bracket through the spring and pry bracket down till the hole in bracket is over hole in chair frame put in screw and repeat for the other end. Hope this helps. Sorry for not getting back to you sooner. If you have already attached the spring then good for you. Happy woodworking. We attached the springs to the base first and spread the springs with screwdrivers to line up to the seat. They are good springs and hard to push apart but then they have to hold heavy loads. It took two of us to accomplish. But happy we did it. The chair was a small rocker. The new springs were identical to the old ones and lined up exactly. If they do not fit screw holes then not the right ones. We took these springs off a rocker so we could paint the rocker. Now how do we get them back on? The screw holes do not match the original holes. The springs seem to be completely compressed and needs to be spread wider to be able it from base to chair. What do we need to do? BEST ANSWER: I had a bit of a struggle with this when I was replacing old springs with these new ones. After attaching one side of the bracket, I then used a medium-large screwdriver to wedge into the spring coils and pry or twist them open enough to get one screw into the proper hole on the other side of the bracket. With that one screw in place, it became easier to continue wedging with the screwdriver and get the other screw holes lined up. I don't think I could have done it without an extra pair of hands helping -- one person prying, the other lining up holes and driving in the screw. There is a little block of wood that goes in the end of the spring that wedges the spring open to align the holes. In a pinch you can use a couple of screwdrivers to pry the springs apart. Put the three in one the top or bottom, pry one of the springs open for one side and insert the screw, then pry apart the other side put in the second screw, finally the last middle screw will fit into the last hole. There is supposed to be some tension on the springs when the chair is in a steady state condition. Do the screws come with the springs? BEST ANSWER: They did not, but I reused the old ones. It was a little difficult getting the springs in position and putting the screws back in, but I had help, so it's all good. My rocker works great again! No they do not come with screws. BEST ANSWER: I disagree with the first answer. It will save you problems if you have about 3/16" elongation in the springs when mounted on the chair, at rest. (You can do that by putting a screwdriver or wood shims between the coils front & back while locating your mounting holes.) Otherwise, the end springs can over-compress when rocking, giving you a noticeable "bump" each time one coil of the spring rides up over the next. I didn't have to drill any new holes, but did need a second set of hands to stretch springs out so they would line up with old holes. Once put back together, mine worked like a new chair. How do you remove the springs from a lazy boy rocking chair? BEST ANSWER: If the springs are the same as those in the picture you just remove the six screws. Please be aware that there is tension in the springs so may need to be expanded somewhat when you attach the new springs. A screwdriver between the tines works just fine to expand the spring. You may need to partially disassemble the bottom to get at the springs. That would depend on the particular model of chair. What tool works on the screws? It looks like a Phillips head but we can't get anything to fit? Are they truly a Philips or is it a torx bit? Hard to give you a definitive answer without seeing it. We had to turn ours over and unscrew the old one. If you have a rotating chair, you'll have to remove the base first. How many curls in the springs? BEST ANSWER: There are 8 coils per spring. What is diameter and height of springs in this Assembly? I need some help understanding how these fit a rocker? Starting with a good captain's chair from a van, I want to build a rocker base? BEST ANSWER: These work with a "platform rocker". If you can find a good picture of the base of a platform rocker (google it) it will be clear how to proceed. We have an upholstered that belonged to my grandfather, then my father and now me and I'm 70. We had it recovered some years ago and the upholsterer put your new springs on the chair. The screw holes in the wood have elongated so we drilled glued and doweled the holes. Now we need to reattach the spring set. Is there a tool that spreads the spring assembly for the purpose of reattaching the base to the chair?